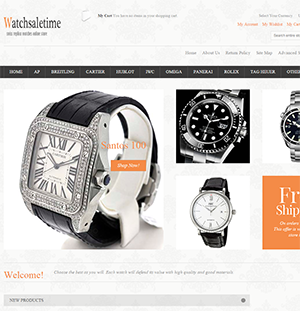 Watchsaletime.com is a replica watches online site that tries very much to have a glamorous and elegant design. It uses a white and gray color scheme, a chic background, large sliding images and orange color accents. It has a nice look, one that is quite catchy for new shoppers. After all, when you are selling fake timepieces online the most important thing is to look authentic and decent. If you really are such a company, it is a totally different thing. The menu isn’t that easy to use. It includes 9 of the available watch brands, the most important ones, while the others can be seen when you click on the “Other Brands” button. The problem is that when you do this, a very long list unfolds and it is incredibly difficult to see all of them. You need to scroll down a lot until you get to the end of the list. The company includes many watch designer names and each one features hundreds and even thousands of items. To ease our search through this very wide collection of replicas, the categories are divided into collections. Furthermore, there is an Advanced Search bar in the right side of the page that allows us to filter the products by size, price, case, bracelet and shape. This way you significantly reduce the amount of time needed for finding the style of watch you like. The store sells both Japanese and Swiss imitation watches. The Japanese made watches cost about $150-$250 and these represent medium quality replicas that will surely work and function nicely for a couple of years. The superior quality replicas are the Swiss ones that are supposed to be considerably more accurate and durable. These cost about $250-$500. My opinion is that these prices are pretty decent for the quality this merchant claims to offer. The product description pages present all the import specifications of these replica watches. Important details regarding the case, bracelet, movement, size, weight and gender are thoroughly presented and explained so that any experienced or inexperienced replica shopper can understand the degree of quality of these fake timepieces. These are some of the best quality, high clarity and most beautiful replica photos I have seen online until now. All products have almost 20 detailed pictures that present the watch from all sides, with close-ups on all important parts and markings. You can see the texture of the dial, the shine of the cubic zirconium, the finishing of the band and even the inside mechanism on the images that have the back removed. The merchant has gone to all lengths to prove the remarkable quality of its replicas. When you buy a replica from this online site you have the possibility of paying with Visa if your order is less than $1300 or by Western Union, Money Gram or Bank Wire regardless of the total of your order. I feel that the fastest, most convenient and securest payment option here is Visa. I, for one, would prefer to pay by credit card than with anyone of those other suggested payment methods. Watchsaletime.com can dispatch packages to any country in the world and the delivery costs are a flat rate fee of $5. So no matter where you want your package delivered, it only costs you $5. The problem with this shipping method is that it is very slow. The package is sent with registered mail and it takes about 15-20 business days to receive your order. A tracking number will be provided, but this will be updated very slowly or at all. The company protects the satisfaction of your purchase by offering a refund policy. The problem is that it does not say how many days you have from the moment you receive the order to return it for a full refund. It only mentions that the watch needs to be in its original conditions, unworn and if the watch is used then the refund can be refused or can be subject to a 25% restocking fee. All returned products must be inspected before issuing a refund. Another important thing, the customer will have to pay for all the return costs. The company manages to disappoint me greatly when it comes to customer service. This is because it does not offer a professional customer care. You can get a hold of their operators only by email or by contact form. Furthermore, the email address is a common Gmail account and not a business one. Also, there is no phone number available or a chat to be able to speak directly and immediately to the company about your worries. When you are buying a replica watch online, there are always many aspects that you need to consider before placing your order. From what we see here, Watchsaletime.com has an elegant looking website, a high usability, beautiful product pictures, numerous payment methods, and affordable prices. These are some pretty convincing aspects for this store, but there are also some cons that can’t be overlooked, and these are: the unprofessional customer service, the slow delivery and the unclear return policy.